Project obstacles and solutions: Dart Container is a leader in the production of single use food and beverage packaging. In 2014, the Dart Corporation announced it had met its capacity and was expanding its Horse Cave, Kentucky campus to include a new warehouse. Building 11 would encompass 650,000 square feet. The $23 million project added 30 new jobs for Dart Container, but countless more in local construction jobs. Dart has its own in-house construction department. Ramsey and Associates poured and finished the inside slab floor as well as all of the surrounding docks, driveways and staging areas. Stewart Richey excavated and built new concrete drains for the site and paved all of the sidewalks. IMI supplied a total of 18,000 yards for this project. On many days, there were multiple pours happening with different contractors. In some cases, the pours were happening at the same time. Stewart Richey would be slip form paving ditch beds while Ramsey was pouring slabs. IMI was able to keep concrete flowing to these pours as they were happening simultaneously. The IMI Horse Cave plant produced the majority of the concrete for the project. 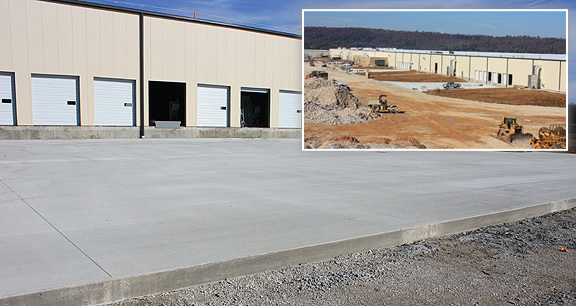 However, when multiple pours were happening, IMI supplied concrete with a second plant out of Glasgow, Kentucky. This ensured the construction schedule stayed on pace to meet the deadline. The Dart Container Building 11 became operational in February 2016. For more information about pouring supplying mass amounts of concrete within your construction schedule, contact the sales representative for the plant nearest your location. Click here.